I was downstairs filling up the dog bowls with water this morning about 6:30 a.m. and I looked out the window. I saw an extremely bright star, even though it was a bit cloudy. "Hmmm, that's really bright," I thought. Then it moved. Just a little...hovering. We live near an airport, so I didn't think that much of it, but I continued to watch it while I filled the other dog bowl. Then there were "sparks" appearing around it; much like landing lights, but way too far from the center light to be a plane. "What the hell?" I turned the water off and I have to admit, being a skeptical person of those sorts of things, I was quite freaked out. OK, really, really freaked out. I stood there for 10 or 15 minutes watching, expecting to discover it was a plane, but it became more apparent to me that conclusion was quite impossible. It continued to hover and from time to time the "sparks" appeared around it--one near, one or two further away. Again, much, much too far to be part of a set of landing lights. Honestly, I started to pass out after I realized this was something very unusual. I was afraid if I ran upstairs to tell my sleeping husband it would be gone by then and I would have missed this weird opportunity to observe such a thing, but I finally decided I ought to go up. I ran to the bedroom window, dog food scoop still in hand, and woke up my husband. It was still there. Still very bright. I got a pair of my dad's birdwatching binoculars to see it better and was shocked at what I saw. It wasn't a blob of light like a star, but an organized set of lights in the shape of a cross or, what seemed to me, lights criss-crossed over the shape of an orb. Faint streams of light emanated from the "thing" and it continued to show the "sparks" from time to time. Unfortunately, all my cameras had dead batteries(though without a serious zoom it probably would have looked like a star on film anyway). After a while another cross-shaped set of lights, fainter and seemingly farther away, appeared and moved across the sky in a perfect upward diagonal to the left. While moving, the lights showed a more reddish color and blinked/flashed. It left a very faint trail. Alien exhaust emissions!? As daylight broke it got impossible to see the "whatever-the-hell-it-was" and we went back to bed after checking to see if there were any strange news reports on TV. 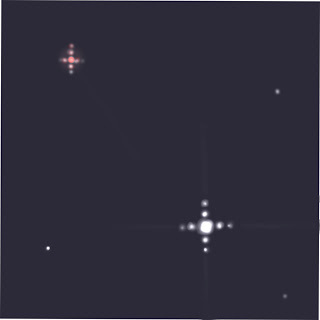 I didn't get to use a camera, but I did render in PSP a fairly accurate representation of what I saw, and that's the image in this posting...the lights beyond the bigger "cross" of lights were the intermittent "sparks" and the smaller "cross" is a representation of the location and look of the moving object which only appeared for a moment. I Gooooogled "UFO March 22, 2007" this morning and I haven't learned of any other people who have seen this, but I, my husband, and his father (who got his telescope out this morning after we called him and saw the reflection of the sun off one of the object's "panels"--he said it looked like a "space station") all saw the same thing and have no way to explain what we viewed. I can't even explain it as a hoax or media stunt...I'm just glad I'm not the only one who saw it, otherwise I would have been dismissed for sure.